This column first appeared in The Sunday Times on 5 August 2018. My father is an adventurer. A month ago, he spent two nights in a barely-anything by barely-anything-meter-squared hide, to watch bears mating in the wild. He was somewhere near Khumo, Finland, and otherwise near not much else at all. It took them longer to get there than they were there. Each traveler was locked into a hide by 7pm, with a box of food and 22 hours of consecutive daylight ahead, on the lookout for shagging bears, storks and wolverines. The sun basically rises again just after it’s set there. It’s a tireless business. Earlier this year he was in Polynesia, hopping from one guano covered island to the next. And next year, there’s a bike trip across America. Did I mention he’s eighty-three years old? Eighty-three going on eighteen. In one room of his home he has a map on the wall, filled with red dots of all the places he’s been. They say that two thirds of the world is covered by water, in this case, the other third is covered by red dots. I’m no mad adventurer like that, but I also enjoy travelling. And a freelance career, no kids, a British passport and a willingness to slum it and go by the cheapest means possible, has certainly helped. Although an upheaval in my life has grounded me firmly in Cape Town for the last six months, while I get my breath back. But at last I’m starting to feel my soles itch again. And so my adventurous dad has begun feeding me his old travel brochures for inspiration. They come in large dog-eared stacks, with my name scrawled on the back of an old itinerary, all tenuously held together with second-hand rubber bands. There’s a lot to consider. Winter and spring rail holidays, elegant river cruises, steamboat jaunts, glaciers, jungles, gorillas and Bucharest. The Russian Arctic, ‘wild Norway’ and Svalard. And ‘The Carribbean’s best-kept secrets’ no longer secret, in a full-colour fifteen-page brochure. Snow leopards, lemurs, toucans and llamas. I page through the brochures, trying to decide whether they’re going to make me a hide and seek, jungle-tent adventurer in permanent daylight, who must remember to get her shots before she goes? Or whether they will make me more of an urban jungle Air BnBer, nosing around for cute Instagram angles and the cheapest scotch, because currency. But my conclusion is that more than anything, these brochures have made me panic. And that’s because I think travel is a lot like books. In the sense that are just too many books I want to read in my lifetime, with more popping up every week. You could read a book a week for decades, and never dent your to-read pile. It’s overwhelming. 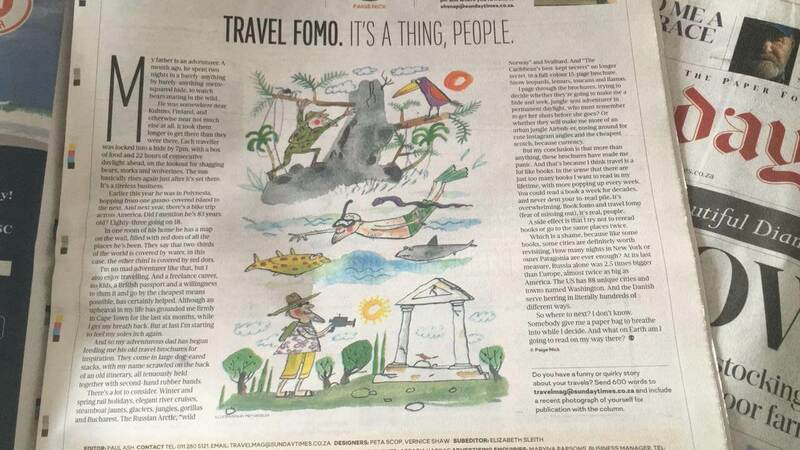 Book FOMO and travel FOMO, it’s real, people. One of the side effects is that I try not to reread books or go to the same places twice, in case it steals time and money away from new places or books I could be visiting. Which is a shame, because like some books, some cities are definitely worth revisiting. How many nights in New York or outer Patagonia is ever enough? At its last measure, Russia alone was 2.5 times bigger than Europe, almost twice as big as America, twenty-six times bigger than France and forty-five times bigger than Japan. America has eighty-eight unique cities and towns named Washington. And the Danish serve herring in literally hundreds of different ways. So where to next? I don’t know, somebody give me a paper bag to breathe into while I decide. And what on earth am I going to read on my way there?